The health benefits of drinking water are more far-reaching than most people know. It is, after all, one of THE most essential elements for our survival. Over 2/3 of our bodies are made up of water, and it plays a huge part in how we function. What’s sad is that up to 75% of adults are chronically dehydrated. And if you aren’t drinking enough water, it could be affecting your weight loss goals! You can metabolize fat better. When you drink enough water, your kidneys are able to work at peak performance, which then helps your live property get rid of waste and toxins in the blood. It’s a natural body detox! A liver that’s working at its highest capacity means increased fat metabolization…. which basically means a decrease in overall body fat! Can’t argue with that, right? You’ll know when you’re actually hungry. Did you know that sometimes you can mistake thirst for hunger? So when you feel hungry, drink a glass of water before eating a meal or snack. Water works as a natural suppressant of appetite because it feels your stomach with the hydration your body is craving! That means you can focus on eating good food only when you are actually hungry and not be tempted by cravings. You can drink without the calories. This is one of the best things you can do for your fitness goals: replace your regular beverages with water! Since we don’t did the same level of satiety when we drink our calories (versus chewing them), it’s easy to get too many through shakes, smoothies, and carbonated drinks like soda. Focus on getting your calories from foods you chew and make water your beverage of choice! Note: If drinking just water sounds way too boring, I understand. The good news is you DO get used to it over time. But if you are still transitioning to this new habit, add a squeeze of natural fruit juice or a lemon wedge for a very low-calorie flavoring. Or you can add some Focus Up drink mix for a boost of nutrients to improve energy, mood, and concentration. It has a natural berry flavor and just 10 calories! To make sure your body is always functioning properly and burning fat at its max, keep that water intake coming throughout the day! You can even purchase a large water bottle to carry with you to work and in your car. You’ll likely be pleasantly surprised at the change in mood, energy, and overall wellness that comes with staying hydrated. Commit today to drink half your body weight in ounces every day! One easy way is to get a large water bottle, and figure out how many times you have to drink it per day. Carry it with you, and make sure you empty it however many times you have to. It will take 3-4 days to get fully hydrated, then the benefits will be noticeable! • Weight Loss- Being dehydrated makes us lack the energy we need to get stuff done. 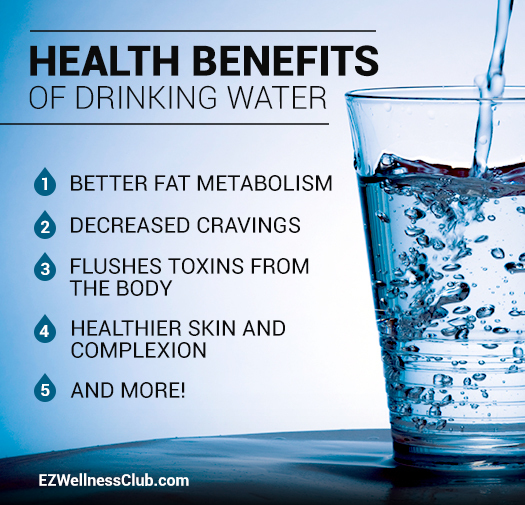 Drinking water helps to keep up our metabolism and can even help with appetite control. Studies show that drinking one glass of water will increase your resting energy expenditure, or the amount of calories your body burns while at rest, by 24-30% in 10 minutes. This effect lasts a whole hour! Also, drinking a glass of water before each meal helps you eat less. It’s really just a matter of volume and space. There’s only so much space in your stomach. If you fill it with water, there won’t be so much room left for food.• Digestion- Water is an amazing digestion aid. Without it, your intestines can get blocked and slow down, causing potty time to be, er… strenuous. Nobody likes to have to spend an hour in the lou. Drinking water helps to keep things flowing freely by helping to dissolve soluble fiber and fats. It also makes your kidneys and liver’s job easier by flushing out some toxins before they reach these organs.• Mobility- Water acts as a lubricant for our joints and cartilage, helping us move around with ease. Cartilage is made up of about 85% water. It only makes sense that we need to continue to supply it with water to stay supple. When our cartilage gets dry and brittle, that’s when we start to walk like Quasimodo.• Brain Power- Drinking plenty of water can help you to sound smarter and be quick witted. When we don’t supply our brain with enough hydration, the cells actually start to shrivel. This causes the brain to have to work harder to do the same work as before. A properly hydrated brain has a better attention span, focus, and memory. Drink up your water and you may have an advantage over many of your coworkers. Here’s looking at you for the next promotion! Wink, wink. You are thirsty all the time. Duh. You feel like taking a nap or feel lazy. Your urine is darker than usual and you don’t need to go so often. You get dizzy or lightheaded. Do you have any of these symptoms? Or perhaps all of them? You need to drink up! It’s time to start the habit of having water handy at all times. Don’t worry were here to help with that too!Tips to Up Your Water Intake Staying hydrated is easy when you have water nearby, delicious and ready to drink. Think about how you can have fresh water around you wherever you spend your day and water will help you to want to reach out and guzzle it down. Here are a few ways others have made drinking lots of water a daily habit.• Buy lots of pretty and functional water bottles to keep wherever you see fit. A fancy water bottle for the office desk will help you to drink while at work and help your style points! I’m seeing your initials monogrammed in gold or silver, just to make you look important. You’ll also need a water bottle for the car. This bottle should be glass or approved plastic bottle that is safe to keep in the sun (DEHA free). While at home, you can keep a filtered water jug in the fridge to have access to clean and cold water at all times or invest in a water delivery system like Culligan or Crystal Springs that stick out like a sore thumb and are hard to ignore. • There’s an app for that! Yes, you can download an app on your phone that will remind you to drink your water. It will also track your intake and let you know how you are doing. The highest rated apps are iDrated and Waterlogged. Both are free to download and use. • Jazz up your water. If you are getting bored with the plain old water or maybe it doesn’t settle well in your stomach you can always add some flavor to it. Some favorites include a slice of lemon or lime or other fruits. You can place a water infuser in your water bottle and fill it with lots of yummy things. You can add a stick of cinnamon to your water which comes with its own boost of nutrition. You can also steep some mint and cucumber to make a fancy spa-like water to help you feel refreshed and pampered. Making flavored ice cubes from fruit juice can be fun and it flavors the water as it melts without adding many calories. Find plenty of ways to experiment with water flavors at Food Network. It’s important to remember that when choosing what to drink, not all liquids are the same. Water is king and any variations that don’t add calories or sugar will do just as well. Sodas, alcohol, and sugary fruit juices should be avoided, of course, but I’m sure you already know that. It’s more a matter of making it a commitment and sticking to it no matter how bad the temptations come. Coffee should be limited and not loaded with creamer and sugar. Coconut water is a great choice as long as it has little to no added sugar. It even helps replenish any lost electrolytes. As long as you reach your recommended water intake, you will see that hydrating well will certainly help you reach your health (and sometimes life) goals. You’ll fall in love with water! How to Resist Food Temptation—For Good! 5 Foods to Avoid to Lose Belly Fat!